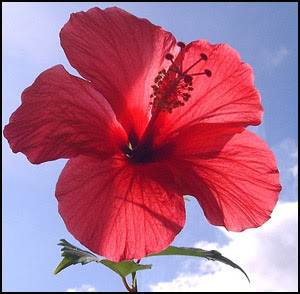 Hibiscus flowers come in a range of species and are grown in warm regions throughout the world. Different species are used for many things including making paper, hair tonics, teas and herbal medicines. 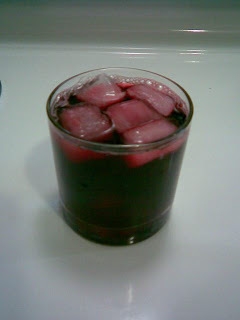 I bought a big bag of dried hibiscus flowers with the intent of using some with my henna hair treatment and using some to make ice cold agua de jamaica. I haven't mixed up my hair concoction yet, but I sure did make a big pot of Jamaica. Jamaica has a taste all it's own. A perk of making it at home is you can steep the flowers for however long you like to get your desired strength. 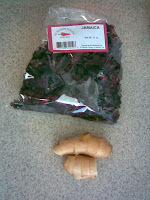 Jamaica is also great paired with ginger, citrus fruits or spices. Hibiscus flowers are a great source of vitamin c and can help reduce high blood pressure. So drink up! Be sure and wear clothing and use utensils you don't mind getting stained. Bring water and ginger up to boil, then add flowers. Let boil for 2 minutes and then remove from heat. Steep the flowers and ginger in the water for 30 minutes to 2 hours and then drain. 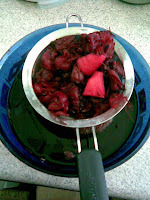 Add your agave syrup to taste. Pour over ice or refrigerate. Wait a minute! You mean to tell me Sorrel is hibiscus flowers? I didn't know that! I've been drinking this stuff for years. Especially a nice treat during the holidays :-). You should try it when it ferments a bit. Just don't operate heavy machinery! Ha ha! Oh, would that be kinda like wine?? Yep these dry flowers go by the name sorrel, hibiscus, jamaica and I'm sure a bunch of other things! Yes, it gives it a taste that rum has been added. Lots of ginger and adding honey helps give it that flavor. Just let it sit for a while, and when the container looks like it will burst, bust it open and enjoy on ice! O.K, so I want to start a batch this weekend.